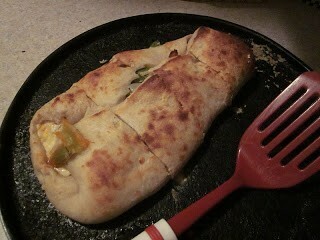 A perfect weekend dinner for the whole family - also perfectly customizable for each serving as a mini 'boli! *Use as much of these ingredients as you like, or feel free to add your own favorite veggies. To make the dough: Add one cup warm water to yeast. Let set for 5 minutes. Add in sugar, spice, and flour. Mix until soft dough forms. Set in a bowl covered with a towel in a warm place (70-75 degrees) for 2 hours, or until doubled. Roll out on flour covered surface. Saute onion and pepper and garlic until softened, about 5 minutes. Chop up your tomatoes. 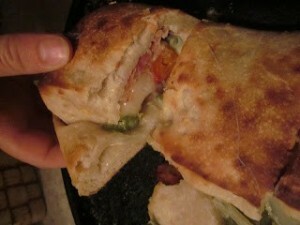 Add sauce, cheese and veggies to one side of the dough. Fold over non-veggie side, seal ends. Bake on a pizza stone at 400 degrees F for 45 minutes, or until cooked through. Let set 5 minutes before slicing. I wonder if 1 cup of sugar is correct in this recipe? Editor's Note: It should read 1 tsp., we have fixed the original recipe. I think you forgot the word "cups" for the first ingredient. It reads "2 flour." It's too much work for me but I have a good idea. What if you buy a comparable type bread already made and continue with the recipe - yum. Can't wait to make it. Thank You for sharing. Editor's Note: Thank you for letting us know about the typo in the ingredients. We have fixed it in the recipe.